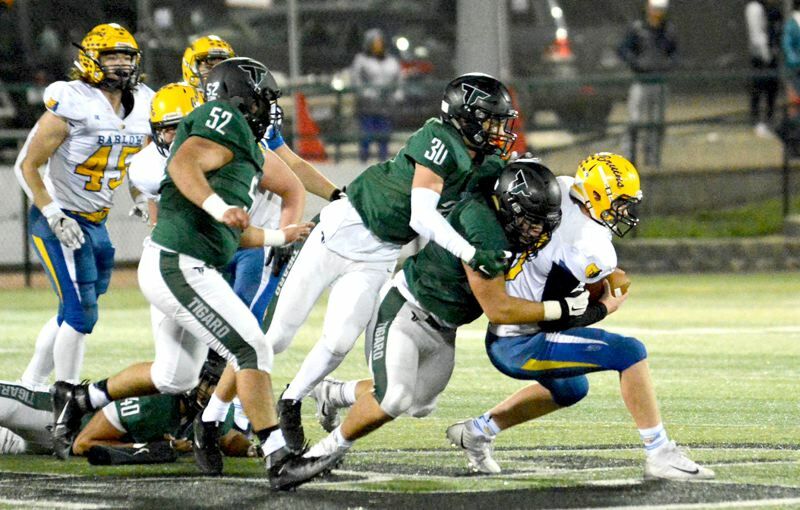 TIGARD — The Tigard High School football team found itself locked in a postseason slugfest with Barlow. But a pair of takeaways, coming on each side of the halftime break, helped turn that slugfest into an impressive Tiger victory. 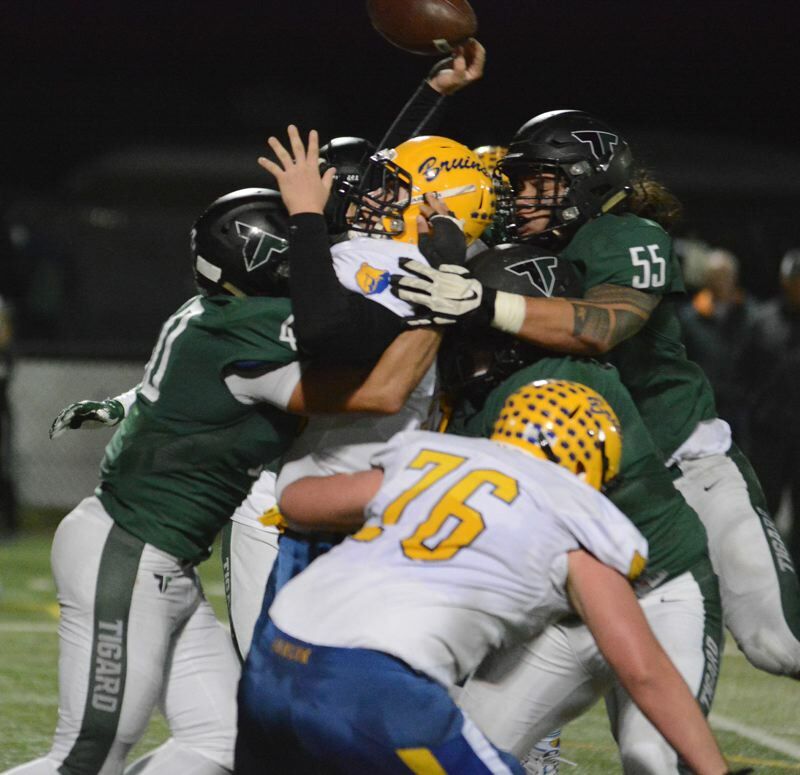 Tigard, scoring 17 straight points in the second and third quarters, rolled to a 45-20 win over the Bruins in a Class 6A state playoff second-round game played Friday at Tigard High School. "Those turnovers were the deciding factors in the game," Barlow coach Terry Summerfield said. "They jumped on us with those two scores and now we're in catch-up mode." With the loss, Barlow, the No. 3 team out of the Mt. Hood Conference, and the No. 12 team in the final OSAA power rankings, finished its season with a final overall record of 7-4, with two of those losses coming against the Tigers. Tigard, the No. 2 team out of the Three Rivers League, and the No. 5 team in the power rankings, improved to 10-1 with the victory. The Tigers also advance to the quarterfinal round of the Class 6A state playoffs, where they'll face Jesuit in a game starting at 7 p.m. Friday at Jesuit High School. 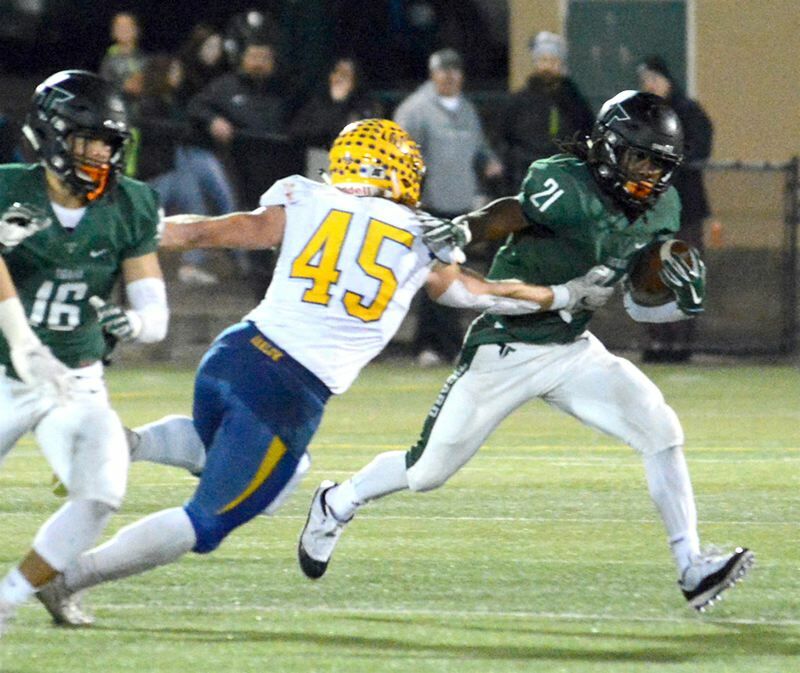 Tigard, in Friday's second-round playoff game, struck quickly, taking a 7-0 lead when senior Malcolm Stockdale scored on a 3-yard run with 11 minutes and 1 second left to play in the first quarter. Barlow answered back, with junior quarterback Jaren Hunter and senior running back Jobi Malary teaming up for a 93-yard touchdown pass play, tying the game at 7-7 with 5:36 left to play in the opening period. Tigard regained the lead, at 14-7, when Stockdale scored on an 11-yard run with 0:36 remaining in the first quarter. But, again, Barlow responded. Malary ended a Bruin drive with a 3-yard scoring run, tying the game at 14-14 with 9:36 left to play in the second quarter. Tigard took the lead back, at 17-14, when junior Jackson Cleaver booted a 40-yard field goal with 5:36 remaining before halftime. The Tigers followed that up with a key defensive play. The Bruins were driving for the go-ahead points late in the first half when they came up against a third-and-6 situation. 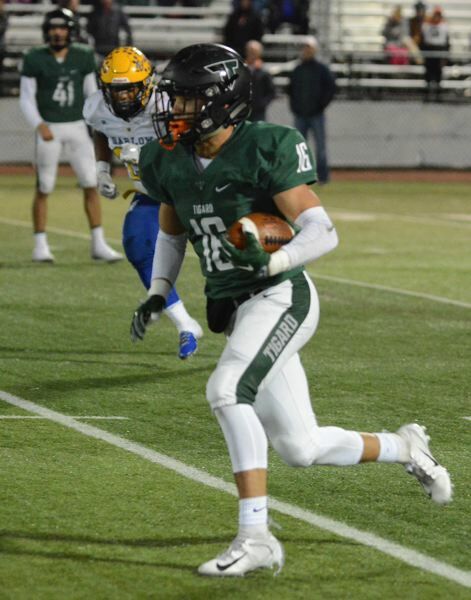 Tigard put on the rush with junior Johnny Nomani breaking through free on an inside lane to the quarterback, while senior Noah Jackman was peeling through on the outside. Hunter flipped his stance and looked to the far side of the field, planning to loop a screen pass over the oncoming rush and into the hands of Malary. Instead, Jackman put on the brakes, tipped the pass out of the air and collected it at his face mask for the interception. "My teammates got good pressure and gave me the opportunity," Jackman said. "I got my hands up, bobbled it for a second and was able to pull it in." Two plays later, Tigard sophomore quarterback Drew Carter found senior receiver Luke Ness for a catch over the middle for a 53-yard touchdown strike. But all Ness could talk about after the game was the block by senior teammate Jazz Ross that set him free around the right side. "I turned upfield and the next thing I see is Jazz taking out two of their guys," Ness said. "That set of plays was the turning point for sure." The sudden shift sent Barlow into the locker room trailing by 10 points. The Bruins were set to get the ball first to start the second half, but Tigard's Hewitt Sullivan recovered a fumbled kickoff inside the 20-yard line. Barlow's defense was intent on saving the day with linebacker Jared Eggleston and Malary each making stops in the backfield, leaving the Tigers to face a third-and-17 situation. It appeared, at worst, the Bruins would get away with giving up only a long field goal try. Carter dropped back and found Ness to pick up the first down at the Barlow 7-yard line. Stockdale surged into the end zone on the next play, giving the Tigers a 31-14 lead with 10:04 left to play in the third quarter. The Bruins got the ball moving late in the third quarter, converting third-and-long when Hunter escaped a pair of tackles and found Charles Ndayizeye on the far side of the field. The drive reached a make-or-break point to start the fourth quarter, and Malary took a pitch and went around the right side to pick up fourth-and-2. The Bruins put their final points on the board on the next play when Hunter found tight end Dominic Jacoby on a 9-yard touchdown strike to pull Barlow within 31-20 with 11:38 to play. Hope for a comeback would only last a few fleeting moments when Stockdale broke off a 65-yard touchdown run on the next play to return the Tigers to a three-score advantage, at 38-20, with 11:27 left to play in the game. The game hit the peak of intensity after Jacoby pulled down a catch along the sideline to convert third-and-4. The play ended with tempers flaring and players shoving each other. The referee called off-setting unsportsmanlike penalties and action resumed. Malary showcased the Bruins' resolve on the next play when he caught a pass in the flat and took on five tacklers for a 12-yard gain before being brought down. Eventually, Tigard's relentless defensive pressure proved too much. The Tigers got sacks by seniors Isaia Porter and Mahmud Mustafa on back-to-back plays to force a turnover on downs, ending Barlow's last chance to get back in contention. "This week a big focus for us on the defensive line was to make plays in the backfield," Porter said. "We need all 11 players to execute for us to create that kind of pressure — it was a team effort," Nomani said. Stockdale capped off the scoring with a 34-yard touchdown run, coming with 7:48 left to play, making the final 45-20. For the game, Stockdale rushed for 332 yards and five touchdowns on 28 carries. Carter completed 10 of 14 pass attempts for 161 yards and a touchdown. Junior Max Lenzy had five receptions for 61 yards. Ness had three catches for 70 yards. 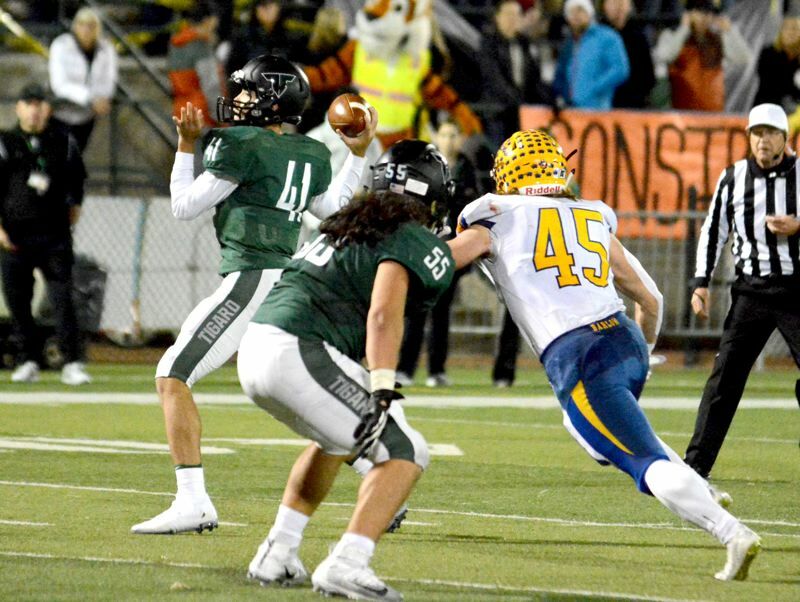 For the Tigard defense, Nomani and Porter each had one-and-a-half quarterback sacks. Mustafa and junior Andrew Carter each had one sack and junior Cole Scott, Jackman, junior Bryce Goetz, senior Emilio Jimenez and sophomore Aden Murphy each had half a sack. Jackman had an interception, Sullivan had a fumble recovery and senior Mitchell Cross led the team with 10 total tackles. For Barlow, Malary ran for 128 yards on 17 carries and he had five catches for 125 yards. Hunter completed 17 of 32 pass attempts for 246 yards. Jesuit, the Metro League champion, and the No. 4 team in the power rankings, brings a 10-1 record into Friday's quarterfinal contest. The winner of Friday's game at Jesuit will face either Lake Oswego or Central Catholic in a state playoff semifinal contest to be played Nov. 23 at Hillsboro Stadium. Dan Brood of the Times contributed to this story.